True Wireless, True Freedom - Completely wireless left and right separate pieces free you from the wire tangles of traditional earphones. The compact charging case provides portable power in a small, convenient-to-carry form, allowing you to recharge your earphones on the go. In a matter of moments, you will be lost in your music. Comfortable and Secure - The tiny and lightweight (4.5g) design prevents any limitations during use. 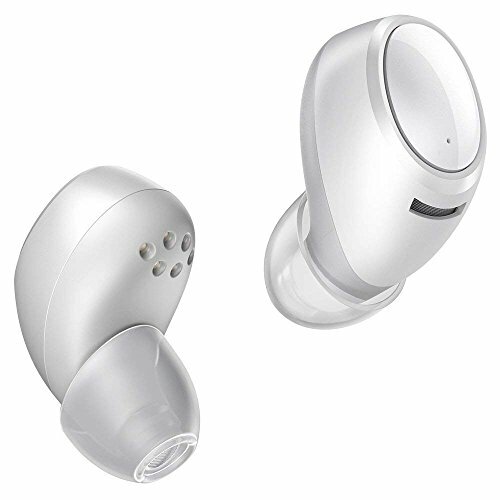 The ergonomic in-ear form is secure with 3 fixed points of support ensuring that the earphones do not fall. In addition, a wide range of eartip sizes lets you to customize your perfect fit. Crystal-Clear Sound - Made from ultrathin elastic graphene, the dynamic drivers deliver a clean, natural, and well-balanced sound. Its high-frequency extension performance brings a crisp sound and ensure you get the most out of your music. A closed-back cover design enhances passive noise reduction to help block out ambient noise and provide an immersive music experience. Stable Connection - The uniquely designed Matrix FPC antenna allows the wireless earphones to receive signals in any direction and ensure a fast and stable link to your device. After removing the earphones from the charging case, they will automatically connect without clicking the power button and pair by the time you are wearing them. With a connection range of 33 feet, you will have no issues maintaining a reliable link. Long-Lasting Playtime - Low-power Bluetooth 4.2 technology gets the most out of each charge. Fully charging the earphones gives you 2.5 hours of music, while the charging case allows the earphones to be charged an additional 2-3 times, giving you 10+ hours to enjoy your music while on the go.